Antonio Fernández Montoya is a flamenco dancer best known as Farru and the son of the flamenco singer Juan Fernández Flores “El Moreno” and of the flamenco dancer Rosario Montoya Manzano, known as “La Farruca”. He is the grandson of “Farruco”, one of the most important dancers of flamenco history and the founder of one of the world leading schools of flamenco. 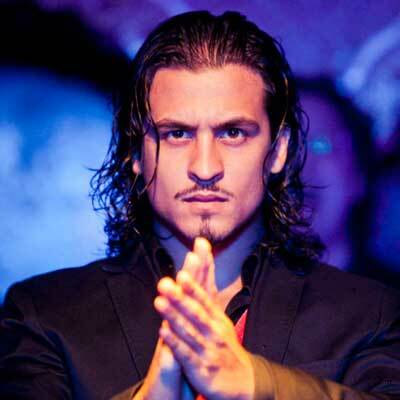 His brother is Farruquito, who is currently considered one of the most distinguished flamenco dancers. In this family environment, it is not surprising that Farru also felt the call of flamenco when he was only a kid. With only 2 years, he got on the tablao of an international festival in Berlin and, when he was six, he participated in his first movie, entitled “Bodas de Gloria”, a production directed by his grandfather Farruco. The beginings of his career were spectacular and Farru didn’t have any intention of stepping on the brakes. In 1998, with ony 10 years, he formed his first flamenco company under the name of “Los Gnomos del Flamenco” with which he performed in many national festivals and also in Europe, in cities like Colonia and Kiev. Three years later, Farruco joined the line-up of the play Incógnito together with Francis Brunn’s. Still in the international panorama, in 2001 Farru joined his brother’s show Farruquito y Familia, in New York, which was his first American tour. In October, Farru made a tour as soloist aroung Mexico, together with Antonio Canales. Despite his short age, Antonio Farru always had a preferential place in the shows created by this brother, who always has supported him as bailaor, like in Raíces Flamencas, La Len Varó, Por Derecho or Alma Vieja. In all of them Farru has been at the height of his role and he has excelled as a singular dancer with a lot of strength and talent. In line with his multifaceted personality, in 2005 he was the main character of the movie entitled El Triunfo, directed by the Datalan director Mireia Ros, who won the Biznaga de Plata award to the best soundtrack in the Festival de Cine Español de Málaga 2006. In that movie, Farru performed together with Ángela Molina and Juan Diego, among others. One year later, Farru presented his first own show as soloist entitled Farruco and he performed at some of the most prestigious theatres of the world such as City Center of New York. Farru is a restless worker and, in 2007, he created another show entitled Al Natural. In that show, he composed the music, the lyrics and the choreography and he shared the stage with his cousin Barullo and the flamenco dancer José Maya. Together, they all travelled all over the world and got the recognition of some of the most important media like The New York Times. He also collaborated with some of the best music starts such us Beyoncé, Björk, Marc Anthony and Paulina Rubio. Farruco’s clan had a meeting in 2008-2009 in order to create a familiar show entitled “Los Farruco”. It was directed by Farru and they made a tour that brought them all again around to the most important scenarios of the world. Finally, we can fairly say that Farru is not only an excellent dancer, producer and flamenco shows director, but he has also collaborated as author in different music albums and in several shows of Tomatito, El Barrio, etc., as well as in the last show of Farruquito, Puro, where part of the music and lyrics where written by him. He also was in a world tour with the sadly deceased Master Paco de Lucía.